This is the first entry in our Maker Faire 2011 Favorite Games analysis. We may as well start with the winning game. Tetris is an action puzzle game. Random colored tetronimos drop from the top of the screen and fall into the bottom of a rectangular well. The player’s goal is to place those tetronimos to create solid lines without any gaps. If done properly, the entire line will disappear. The game ends when the well fills with unfinished lines. 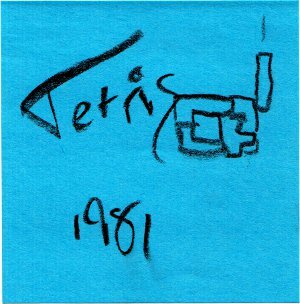 As mentioned before, Tetris was developed in 1984 by Alexey Pajitnov. It quickly swept the world, reaching the United States in 1986. Along the way – and partially thanks to its Soviet Russian origins – it has been involved in many copyright and intellectual property tangles. 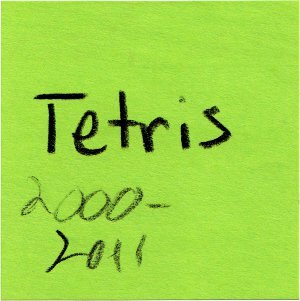 Today, the rights are owned by The Tetris Company, which itself is co-owned by Alexey Pajitnov himself. Thanks to its simplicity, addictiveness, and popularity, there are likely hundreds of Tetris implementations in the world. 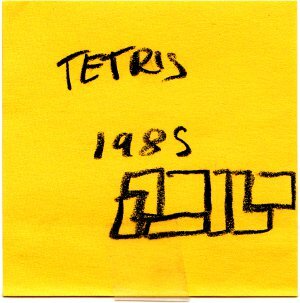 A list of computer systems without Tetris would be shorter than a list of computer systems with Tetris. Tetris was one of our best-distributed games, getting a total of 27 votes. Tetris votes showed up in every age bracket we asked about, made it to the top ranks in four of them, and won two of them. Tetris even claimed our earliest vote from a contributor born in 1940. Unfortunately, the sole 2000-2011 Tetris vote did not list an age, and so we can’t claim that Tetris had the widest age span as well. The voting on Tetris may, however, be somewhat misleading. While there are many, many Tetris games, they all go under the name “Tetris”. A vote for Tetris may be a vote for the popular Game Boy version, a vote for the recent iPad version, or a vote for the original text-based Elektronika 60 version. We received one vote for “Super Tetris”, but even that includes a DOS, Macintosh, and Amiga version. 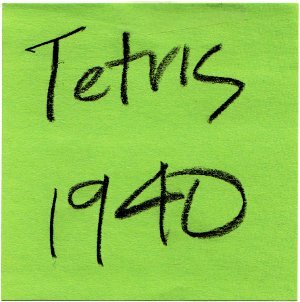 Tetris’s simplicitly has led to a huge number of spinoffs and variations, both official and unofficial. The Tetris Grandmaster series is frequently used for solo competitive play, where a single player requires lightning reflexes and thought in order to clear hundreds of pieces. Videos of the best players can be found online, and if you think the beginning is impressive, skip ahead to the end. Tetris Party is designed for multiplayer competitive play. While the game includes the same classic tetronimos we’ve been playing with for two decades, it has new game modes that are quite unlike the conventional mode. Speaking of multiplayer, TetriNET is a networked multiplayer version. Up to six players can compete over the Internet. While most multiplayer Tetris games either keep the players almost entirely independent or make the players interact directly, Tetrinet takes a middle-of-the-road approach. While you can’t directly influence a player’s game, you can collect powerups and attacks, then use those against your opponents. The simple gameplay of Tetris is extremely conducive to strange modifications. Six years after Tetris’s release, Alexey himself developed the obscure Hatris. Some variants have used 3-dimensional gameplay, including Tetrisphere, the short-lived Virtual Boy 3D Tetris, and probably the most successful variant, Welltris. Despite the ease of modifications, these major changes are frequently seen as gimmicky and have rarely been successful. Finally, as an important icon of gaming, Tetris has been used for artistic statements and for real-world installations. In the real world, it’s been used for street art, performance art, and more than a few building-sized games. Artistic variants are just as common, including Tetris 1D, and Bastet, a Tetris variant that actively chooses the least useful block for you. Our entries for other games probably won’t have the sheer bulk that this one does. However, Tetris’s legacy warrants this detailed post. Come back in a few days for the next game!